Can Yoga play a role in the social psychiatric treatment of PTSD? Background: Emotional pain and traumatic experiences long after the trauma has ended stored in the body. It is natural for man to survive and that the body and the mind reacts to danger and trauma. It is good to remember these dangerous situations so that they in the future can be avoided. However, the maintenance of stress in the body can also cause unpleasant side effects. According to the social psychiatric ideas, psychological symptoms are understood as a result of four levels of functioning (psychological, physical, social and individual) and patients diagnosed with Post Traumatic Stress Disorder (PTSD) can develop symptoms on all levels. However, there are indications that in the treatment of PTSD, the attention to the interaction of these four levels is lacking. Objective: To investigate what PTSD is and which (social-psychiatric) treatment should be offered. Examine how yoga relates to the four levels of functioning in social psychiatry and if yoga can be part of PTSD treatments. If yes; at what level and how to add value. implementation: A review of the literature on the effects of a traumatic event or yoga and a useful addition to treatment can be. Results: There is an emerging scientific basis are shown that yoga as a possible complementary treatments supports it, in patients with PTSD. Conclusions: There is sufficient evidence to yoga as to consider. additional treatment within the regular treatment provision This research offers opportunities for further development of yoga in the treatment of PTSD but also other psychiatric disorders such as for example psychoses. From my practice as a yoga teacher, I thought yoga classes to women in Rwanda who are traumatized as a result of the genocide in 1994. I did this in 2010 for three months for a U.S. non-governmental organization called Project Air as yoga discipline within an ACT team with the aim relief of symptoms and thus a better quality of life. Professionally, as a community psychiatric nurse (hereafter referred to as SPV) in Amsterdam, I am also dealing with patients suffering from post-traumatic stress disorder (hereafter referred to as PTSD) and complex trauma. In practice in the Netherlands I hear that patients like the Rwandan women complain that they don’t feel their bodies or even experience physical symptoms, loss of control over their feelings and body (not being able to sleep and relax whenever they want), depression and stress. This is no coincidence. Emotional pain and traumatic experiences are long after the trauma has ended stored in the body. Van der Kolk (1994) describes this as “the body keeps the score”. It is natural, that humans want to survive and that the body and mind react to danger and trauma. It is good to remember so that these dangerous situations can be avoided in the future. However, the maintenance of a stress in the body can also cause unpleasant side effects as described above. Patients diagnosed with PTSD often experience symptoms at all four levels of function, but according to the literature on PTSD treatment I read there is little attention the four levels in its entirety (i.a. Jongedijk, 2008; Jongedijk, 2010). I wonder if yoga can play a role here. Can Yoga be used as a complementary method of treatment in the social psychiatric treatment of PTSD? The word ‘trauma’ literally means harm or injury. This can be physical injury, but another possibility is psycho-trauma. A clear distinction should be made between ‘ordinary’ unpleasant and stressful life events on the one hand and traumatic events on the other. Person has experienced, witnessed, or was confronted with one or more events that involved actual or threatened death or serious injury itself, or posed a threat to the physical integrity of self or others. According to the DSM-IV, patients with PTSD constantly relived the traumatic event. They are persistent in avoiding the stimuli associated with the trauma or suffer from numbing of general responsiveness, and this was not present prior to the trauma. They have persistent symptoms excitability, which was also not present prior to the trauma, the duration of the disturbance is longer than one month and the disturbance causes clinically significant distress or impairment in social, occupational, performance, or other important areas of functioning. These symptoms (immediately after a traumatic event) are regarded primarily as a normal reaction. They are manifestations of a imbalance that needs to be recovered. This acute stress reaction can be seen as a natural response, focused on survival (Gersons Olff 2002 through 2002). People have mental resilience and self-healing ability that is trusted in the first place. Each has its own processing. It only becomes dysfunctional when symptoms persist. Actually: PTSD so the stagnation of a normal process. There are several factors that affect the mental (un-) health as shown in the dynamic stress-vulnerability model of White (2004). This model shows how a event in someone’s life, the characteristics of the individual and the environment together influence and thus influence the risk of mental health. A large part of the world experiences one or more psycho-traumatic events during their life. The largest and most influential study include the prevalence of PTSD is the National Comorbidity Survey (NCS) ,carried out by Kessler (Kessler et al, 1995). This study found that about 61% of men and 51% of women had experienced a traumatic event. Fortunately, not everyone developed PTSD. The NCS (Kessler et al, 1995) found a PTSD prevalence of 7.8% of the total trial and PTSD occurs twice as often in women than in men (10.4% v. 5%). Co-morbidity with PTSD is also common, and it is rather norm than the exception (Kessler et al, 1995; Creamer et al, 2001). The disorders which are mainly present parallel with PTSD were abuse or dependence on resources (75%), generalized anxiety disorder (44%) and depression (20%). On an annual basis, according to the Nemesis research (2) 18% of the Dutch population suffers from psychological problems. At number two with 19.6% are the anxiety disorders (de Graaf, Dorsselaer & ten Have, 2010). Reliving and active avoidance can be seen as quite specific symptoms in PTSD (Young Dijk, 2008). Other symptoms such as decreased interest, increased irritability and concentration problems, according Jongedijk (2008) are less specific and are strongly associated with depressive symptoms. Trauma symptoms that are not or insufficiently described in PTSD, but according to Jongedijk often present, include lack of resilience, confidence, problems with handling emotions and affects, re-traumatization, psychosomatic complaints and reduced physical health. Psychosomatic symptoms have long been associated with trauma. At the end of the 19th century many physical complaints were described in traumatized patients (include sexually traumatized patients) by psychologists and psychiatrists as Freud, Janet and Briquet. Research shows that a having PTSD and traumatic experience may result in physical symptoms (Olff, 2002). It is stated that 70% of patients with PTSD has sleep disorders and are misunderstood because of their unexplained physical complaints (LOK in Dutch) (Jongedijk, 2008; Van Liempt et al, 1994). PTSD and co-morbidity of these (unexplained) physical symptoms require particular attention because of the potential impact this has the further course of the disease and functional limitations that it can give (Jongedijk, 2008; From Liempt et al, 1994). Olff (2002) describes (unexplained) physical symptoms such as fatigue, back pain, chest pain, palpitations, muscle pain, nausea, shortness of breath, dizziness, stomach and intestinal complaints etcetera. Often patients with LOK receive extensive medical examination, but do not get the proper treatment. This causes inconvenience and high costs. Both the patient and therapist are not satisfied with the treatment (Olff 2002). Finally, it is due to psycho-trauma clients can create lack of social support system. This social vulnerability may arise due to patients behavior. PTSD from the perspective of the social psychiatric thinking. At the physical level, it often happens that patients with PTSD psychosomatic complaints such as described in the preceding paragraph. According to Zwart (1998) PTSD symptoms are often physically experienced and presented. At the individual level it means that the experience and difficulty in processing of traumatic life events says something about the coping behavior, lack of resilience,psychological functioning and self-image in which a patient may have a feeling of disgust. The latter is according Jongedijk (2008) something common in PTSD. Just as fear, disgust and pain can provide protection. Sometimes, the disgust is so extreme that it is no longer functional. This can lead to, for example, self-mutilation (disgust own body) or excessive washing (to be feeling dirty). On social level PTSD and trauma can cause problems in relationships with colleagues at work, etc. because people either obsessed with the trauma or are running away from it. In has been shown that people who receive less social support are more likely to develop PTSD more show symptoms of PTSD (Hadders & Utrecht, 2008). At the social level, vulnerability may occur when patients have problems around embedding in society by (long-term) absence from work because of the symptoms, loneliness, social isolation, poverty and stigma (Beek-Schelee Akker, 2011). Patients with PTSD are at risk to develop multiple levels of functioning. complaints. The treatment of PTSD, and the role of the SPV (social psychiatric nurse) herein. According to the Multidisciplinary Guideline (psychiatric guidelines PTSD) The treatment consists medication and psychological interventions. In these guidelines, the trauma-focused therapies (TFT) such as cognitive behavioral therapy (CBT), exposure therapy and EMDR (Eye Movement Desensitization and Reprocessing) is recommended. The result of treatment depends on the type of trauma and in which phase of life it’s emerging. There is little attention to body-oriented therapy in treatment of PTSD. It has been argued that body-oriented therapy an integral part in the treatment of PTSD should be next to the psychotherapy (Black, 1998). Studies in ‘De Vonk’ (5) showed that as patients present more physical complaints, they develop the less active coping mechanisms because they thereby avoiding more and are seeking support. The guideline for the diagnosis, treatment and guidance of adult patients with an anxiety disorder was overhauled in 2009. This includes the diagnosis PTSD. In both versions, the stepped care model starting-point for the instruction. The purpose of treatment is defined here as the pursuit of recovery. After recovery, relapse prevention is offered before treatment is completed. If a SPV (social psychiatric nurse) is skilled for this, then besides Prevention also cognitive behavioral interventions can be performed. In addition, the SPV has an important role in identifying symptoms and seek treatment (from the draft guideline revisions Multidisciplinary Directive, 2009). Off course there will also focus on the social network of a client and the SPV should involve them in the treatment and counseling. Case RL: ‘I am treated for three traumatic experiences in the years of treatment. The first treatment (2000 – 2002) consisted of writing therapy and the second in 2007 EMDR treatment. In the beginning I missed personal attention to me as a human in the PTSD treatment. It had rapidly fill in questionnaires. I did not feel seen as a person but found that a sticker was on me too fast. I was seen as the problem and solutions too fast instead of looking at me as a person. At home, my wife did not know what to make of me. I was an emotional wreck! I had to bring my partner to therapy once, but she should have been more involved. In all that time she was invited one or twice I think. My wife never knew what happened to me at all. Only when I started therapy, I told her. The understanding since has gotten better. Here I see an important role the SPV in treatment. Seeing the person behind the patient and the involvement of the system at the treatment. I’ve also never been offered body-oriented treatment, no one ever talked to me about this. In the treatment of PTSD, little attention is paid to the entirety of the four levels. Certainly the physical aspect seem not or just little addressed. The question is: Would yoga and body-oriented intervention can contribute to the treatment of at least the physical symptoms of PTSD? Could this affect the further course of the condition and recovery? And how can the SPV herein play a role? Yoga is a general term for the practice of physical postures and breath work, in which attention is carried out, to be described. There are many types of yoga and in the West, especially the most famous and popular forms practiced. Although yoga in the West is often seen as just a physical practice, because the practice often begins with postures such as in a yoga studio or gym, it is more than that. Yoga is an ancient, self-empowering practice that uses a range of tools to enhance well-being and to maintain and restore health. It can be a powerful tool on the journey of personal and spiritual growth, as well. 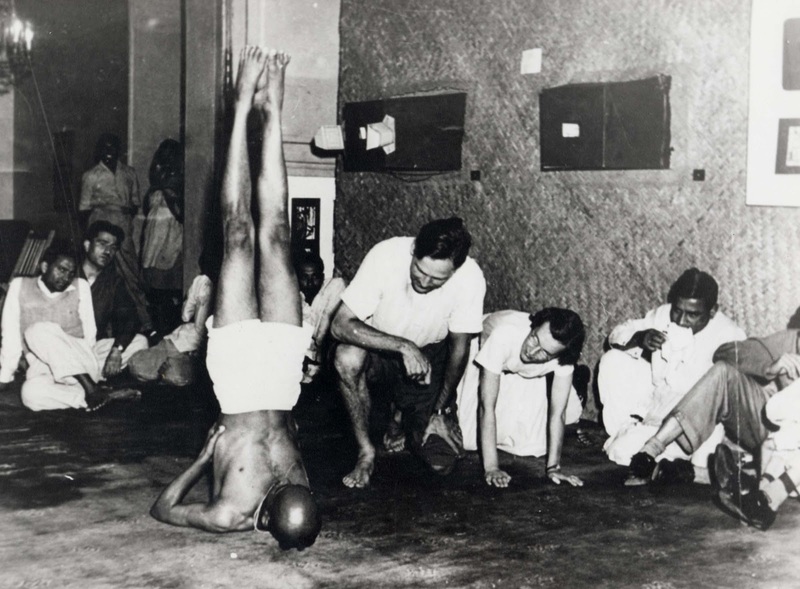 Krishnamacharya (1888-1989) is considered the grandfather of today’s Yoga seen together with two of his famous students BKS Iyengar and P. Jois. Yoga is traditionally divided into eight aspects (in Sanskrit “Astanga” see Table 1). According to Iyengar (2002) yoga can be seen as consisting of three layers: the external – internal – and the inner layers. Or mentally, physically and spiritually. The eight aspects of Yoga can be divided in these three levels. The first level of yoga consists of do’s and don’ts. Yama and niyama are the social and individual ethnic disciplines that are also seen historically in all civilizations. Niyama teaches about what should be done for the good of the individual and society. Yama is about what we should do to prevent to harm the individual and society. The second level, asana, pranayama, Pratyahara. Asana is practicing various postures with the body. Pranayama is the science of breath. And pratyahara is observing the conditioned response. The third and final level of yoga is described separately in yoga sūtras (6) as ‘wealth’ of yoga. Dharana, Dhyana and Samadhi, the effects of yoga are not part of the exercise itself. Dharana means concentration or complete attention. Dhyana is meditation and Samadhi is the culmination of yoga: total bliss. Yoga is a complete exercise of combining elements of mindfulness, meditation, breathwork and rhythmic motion in the form of postures (asanas) with a focus on the present. When this rhythmic movement is performed with others it brings togetherness (Spinnazola et al, 2011). The meditative aspects of yoga have been shown effective in reducing anxiety, depression, stress, and in the treatment of substance use/ abuse. Also, it has been shown that meditation helps with emotion regulation, processing through self reflection and seeing perspective. Physical pain can be softened and physical condition improved through yoga. The therapeutic qualities of yoga asanas, are probably related to neuro-cognitive aspects of PTSD. Yoga is often practiced in the context of a search for answers to questions in life and purpose. It assumes that it needs a balanced psyche and knowledgeable yoga teacher. Decuypere (1986) says in the magazine for psychiatry that there may already be a vulnerability present when someone is psychotic after a yoga session. Yoga would may have provoked it. According Decuypere yoga is harmless as long as you use your wits. “In the hands of unbalanced people it can sometimes be explosive material”. It is good as a practitioner to be with the patient. Talking about their interest in existential problems and focus on philosophical themes promotes understanding and patient will be more inclined to speak about it. As described previously, patients with sleep disorders and PTSD are often misunderstood and have unexplained physical symptoms. Yoga is often first applied on the physical level. At yoga, sometimes physical postures are performed that affect the physical and mental condition. If a patient can relieve themself from physical pain and make he body powerful, it can help to restore a sense of confidence in one’s own body. A patient may loose the feeling of powerlessness when he or she experience that he or she can do something themselves to fight the pain. This also applies for insomnia. When they learn how to make themselves sleep better they will be gain self-confidence. When they attributes these success experiences to themselves , this will work motivating. Patients can get to know their physical reactions, develop body awareness and lean that their physical tension pains can be reduced by exercises. As they explore the relationship between psychological stress with physical pain, they are better able to recognize, express, identify these feelings and thereby processing (Black, 1998). Avoidance can pass into control and a patient can get more grip for the strong feelings around trauma. Patients learn to deal with their physical limits and can improve self-image. By improving the self-image, the individual level is touched, which is also a gripping point yoga can be in social psychiatry. Yoga is a mindful practice. Hereby it’s creating a way of ‘exposure’ that one himself has control over. In contrast to what occurs in trauma, one in yoga always have a choice. The practice of yoga can be discontinued at any time by a patient. This allows coping to develop. They might be looking for meaning or spirituality. Yoga is not a religion and is independent of religion, though there is some overlap with visions in Hinduism and Buddhism which also engages the individual level. The social level from the social psychiatric viewpoint is not the main point engaged in yoga, but it is possible level to be touched. Yoga can be an individual practice with a teacher or trained therapist but often in a (small) group. The teacher or therapist also practice along, this can create equality. There is peer support. From this social contacts arise. The strength of the patient and his or her network are central to social psychiatry. In PTSD treatment, having a shared experience with others to contribute to recovery by learning not to repel others. Integrated motion and breathing with others, can create a sense of connectedness (Emerson, 2011). “The individual is a part of a collective, united by rhythmic elements in synchronous movement which can give a sense of connection and is a part of healing traumas (Spinnazola et al, 2011). This can also counteract loneliness and social isolation which is a characteristic of the social level within the social psychiatry. In social psychiatry it’s in principle not about the individual patient but always about the patient in the social and cultural context and social intercommunication. By having better control on (unexplained) physical symptoms, when sleep better and being in better health, one will be less vulnerable to (long-term) absenteeism from work (Beek Schelee Akker, 2011). This will reduce the risk of loneliness and social isolation. Can Yoga play a role in the social psychiatric treatment of PTSD and what can the SPV do this? In the treatment of PTSD oe complex trauma, little attention is paid to the four levels in its entirety. Certainly the physical aspect seem little to be addressed. At the physical level, yoga can definitely answer offer to shortcomings in the treatment of social psychiatric treatment of PTSD. The physical practice of yoga postures can ensure that a patient learns to be in contact with his or her body in the present. This gives them a sense of security because they are often overwhelmed by bodily sensations (van der Kolk, 2006). As described, the main features of yoga (Postures, breathing and meditation) proved effective in reducing symptoms of trauma. Psychiatrist van der Kolk has partnered with yoga teacher David Emerson in America and they developed a method where yoga is used in the treatment of PTSD: ‘The Trauma Center Yoga Program (7). Van der Kolk (1994) said that the purpose of the treatment of PTSD is to assist people to live in the present life, without feeling or behaving according to the irrelevant demands belonging to the past. Due to the natural survival system of the body, many people with PTSD mainly focused on trauma and not on the here and now. This method it is also called “Trauma Sensitive Yoga ‘. This method has been thoroughly researched and successfully applied in the treatment of PTSD in America. ‘Trauma-sensitive yoga’ is a physical down-to-earth form of yoga. It is aimed at skills. It is structured but there is always choice. It is a slow process where patience and repetition is used. David Emerson describes in his book ‘Overcoming trauma through yoga’ (2011) that there are four major themes have emerged from the research use of yoga in people with trauma. These are: the experience of the present moment, having a choice, take effective measures and the creation of rhythm. There are several ways that yoga could find a place within the social psychiatric treatment of PTSD. In the new draft guidelines is said that there is always started with the based interventions psycho-education, activation and prevention of avoidance (draft guideline revisions the Multidisciplinary Directive, 2009). These interventions can be implemented by a SPV (Social Psychiatric Nurse). There may at least be given psycho-education about yoga and are used for activation. In addition to obtaining a history and making an analysis, a SPV can create (treatment) plan with the patient. If a patient would like to participate in yoga (especially for the target group), the SPV can support this by processing trhis into that plan. As the SPV also uses for example CBT interventions (or part techniques) when trained for this, the same applies to yoga interventions. For instance, the SPV can start or end a treatment session with a patient with some techniques from yoga. To close the nursing methodical framework is off course evaluated and the plan adjusted if necessary. The above interventions are partly the result of best practice and effective partly shown and would need to be further investigation. In the Netherlands, yoga programs in the treatment of PTSD is in development. In June 2012 starts a pilot at Centrum ’45 to Oestgeest: Trauma sensitive yoga to a group of veterans using the method of van der Kolk. Patients diagnosed with PTSD often experience symptoms at all four levels of functioning according to the social psychiatric thinking, and not always there is attention to the four levels in its entirety. Especially on the physical and social level treatment sometimes lack. Yoga grabs mainly on the physical level where physical symptoms that are often present in PTSD can be reduced and patients can find body control again. Yoga does not fully connect on all four levels of functioning but it does at those levels where conventional therapy fails. Given the beneficial effects of yoga with PTSD can be said that this physical approach is become an evidence-based complementary treatment method in multidisciplinary social psychiatric treatment of PTSD. However, it appears that there is a need for more formal controlled research on trauma sensitive yoga within the social psychiatric treatment of PTSD to evaluate it’s efficacy and effectiveness. Finally, possible bias of the writer is not excluded in this article. Besides being a community psychiatric nurse (SPV) she’s also a passionate yoga teacher. PTSD is a heterogeneous disease that is associated with a wide variety of co-morbidity (Creamer et al, 2001). It requires an individual treatment protocol. Yoga would need to be considered alongside the existing PTSD treatment when the patient is open to this. It is important that yoga is offered by a confident, competent teacher. A teacher is involved, accessible, highly skilled in yoga and is willing to receive feedback and listen (Emerson, 2011). When this is not the case, it is advised to consider another teacher. The SPV or other practitioner would need adequate training when applying (partial) yoga techniques. This practitioner should be able to provide adequate information and psycho-education on the indication and contraindication of yoga. It’s advised to learn more about complementary treatment. The counselor with final responsibility as the psychiatrist, SPV or other practitioner should recognize the meaning of yoga to enjoy it’s potential role in treatment. The PTSD treatment should of course meets the needs and wishes of the patient. within the Acute Behandelteam (ABT) and long-term psychiatry (F)ACT-team – The ABT is a part of the Emergency Department of Psychiatry Amsterdam (SPA), and this is one of the services of the organization called Arkin in Amsterdam. ‘Netherlands Mental Health Survey and Incidence Study’ (NEMESIS-2) is a study of the mental health of adults 18 to 64 years in the general population. R. L. has been in Bosnia experienced trauma 6 months. He is 43 years old, married and has a son (2000). He did not directly suffer from PTSD. End of 2000, he first treated to 2002. Then it started again in 2007. Interviewed by Anneke Sips on 03-06-2012. De Vonk: Since 1994, Centrum ’45 a department for traumatized refugees and asylum seekers. This section is called ‘De Vonk’ and is in the town of Noordwijkerhout. De Vonk has a day clinic and a clinic. ago written by Patanjali, which is seen as one of the greatest yogis ever. The Trauma Center Yoga Program, is a collaboration of yoga teachers and trauma expert doctors and has been developed as a form of Hatha yoga in addition to treatment for PTSD and related disorders since 2003 (Emerson et al., 2009). Bromet E, M, H., RC, K., CB, N., & A., S. (1995). Post Traumatic Stress Disorder in the National Comorbidity Survey. Arch Gen Psychiatry, 52(December 1995), 1048-1060. Dayna, M. (2008). “Yoga in America” Market Study Practitioner Spending Grows to Nearly $6 Billion a Year. Yoga Journal, October. Decuypere, J. (1986). Ziek of mystiek? Tijdschrift voor psychiatrie, 10(28), 719-731. Graaf, R. D., Dorsselaer, S. V., & ten Grave, M. (2010). De psychische gezondheid van de Nederlandse bevolking De psychische gezondheid van de Nederlandse bevolking. Utrecht: Trimbos. Hadders, Z., & Utrecht, U. (2008). Trauma’s , sociale steun en copingstijl als voorspellers voor posttraumatische stress. Symptomatologie bij een groep Vluchtelingen. Stress: The International Journal on the Biology of Stress. Jongedijk, R. A. (2010). Begeleiding en behandeling van patiënten met een posttraumatische stressstoornis. Modern Medicine, (4), 127-130. Jongedijk, R. A. (2010). Diagnostiek van de posttraumatische stressstoornis. Modern Medicine, (3), 111-115. Jongedijk, R. A. (2008). De gevolgen van psychotraumatische ervaringen: meer dan PTSS alleen? Cogiscope, 01(Apa 1994), 13-17. Kessler, R. C., Care, H., & Ma, B. (1994). Methodological studies of the Composite International Diagnostic Interview ( CIDI ) in the US National Comorbidity Survey. International Journal, 7 (Cidi). Kolk, B. A. v. d. (1994). The body keeps the score: Memory and the evolving psychobiology of post traumatic stress. Information Age, 1-21. Krishnamacharya, S. T. (1938). Yoga Makaranda – Yoga Saram ( The Essence of Yoga ) First Part. Madurai C.M.V. Press, October. Lindy, Jacob, D., Green, B. L., & Grace, M. (1992). Somatic reenactment in the treatment of posttraumatic stress disorder. Psychotherapy and Psychosomatics ISSN: 0033-3190, 57(4), 180-186. Olff, M. (2002). De PTSS en onbegrepen lichamelijke klachten, 1-18. Onderwater, K., Padt, I. van der, Romme, M., Venneman, B., & Verberk, F. (2002). Dossier Sociale Psychiatrie: Strategienota sociale psychiatrie. NVSPV kennissite, maart. Emerson, D., Hopper E. (2011). Overcoming Trauma through Yoga. North Atlantic Books: Berkeley. Jong de, J. (2011). Handboek academisch schrijven. Coutino:Bussum. Padt van der, I & Venneman, B. (2010). Sociale psychiatrie. Boom Lemma: Den Haag. Conceptrichtlijnherzieningen van de Multidisciplinaire richtlijn Angststoornissen bij volwassenen (eerste revisie). (2009). Padt, Ruhe, Cremers, & Derks. (n.d.). E-130-Eindopdracht-handleiding-SP-10.